bibliography * The PainScience Bibliography contains plain language summaries of thousands of scientific papers and others sources, like a specialized blog. This page is about a single scientific paper in the bibliography, Akhaddar 2010. 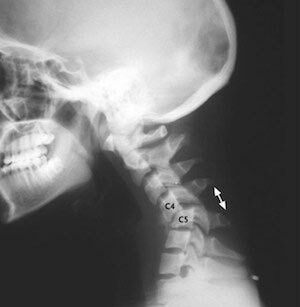 Akhaddar A, Boucetta M. Dislocation of the Cervical Spine. N Engl J Med . 2010 May 20;362(1920). PainSci summary of Akhaddar 2010?This page is one of thousands in the PainScience.com bibliography. It is not a general article: it is focused on a single scientific paper, and it may provide only just enough context for the summary to make sense. Links to other papers and more general information are provided at the bottom of the page, as often as possible. ★★★☆☆?3-star ratings are for typical studies with no more (or less) than the usual common problems. Ratings are a highly subjective opinion, and subject to revision at any time. If you think this paper has been incorrectly rated, please let me know.